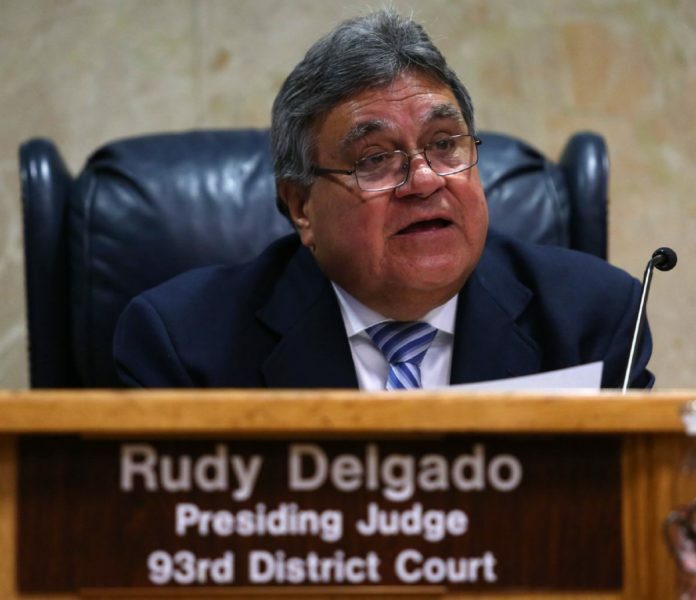 McALLEN — Federal prosecutors filed a superseding indictment Tuesday against former District Judge Rodolfo “Rudy” Delgado that adds a conspiracy charge to his previous six federal charges. Delgado now faces three counts of federal program bribery, three counts of violating the federal Travel Act for using a phone to broker the bribes and one count of conspiracy to commit bribery concerning programs receiving federal funds. The conspiracy and Travel Act charges each carry a maximum of five years in prison if convicted, while the more serious bribery charges each carry up to 10 years in prison. In addition, all carry a fine of no more than $250,000. Delgado, 65, who first took the bench in 2001, retired and resigned April 30. The new conspiracy charge is tied to bribes he allegedly took from Edinburg-based attorney Noe Perez from January 2008 through May 2016. During this time period, Perez gave Delgado a $15,000 truck and paid him cash bribes “between $250 and $350” on at least 20 occasions “in exchange for favorable judicial consideration” on cases Perez had in his courtroom, according to Tuesday’s indictment. Perez pleaded guilty May 11 as part of a plea agreement to one count of conspiracy to commit bribery concerning programs receiving federal funds, according to court records, and faces a prison sentence of up to five years and a fine of up to $250,000. He is scheduled for sentencing in December in Houston’s federal court and may be eligible for a reduced sentence given his cooperation as a government informant from June 2016 until Delgado’s February 2018 arrest. Federal prosecutors allege Perez paid Delgado two cash bribes worth $260 each and one worth $5,500 during this time frame. In exchange, Delgado released Perez’s clients — all of whom had been arrested after violating the terms of their probation — on personal bonds, according to the indictment. Delgado pleaded not guilty to the federal bribery and Travel Act charges and will appear in Houston’s federal court July 2 for his arraignment on the conspiracy charge. His trial is tentatively scheduled for September. This story was updated to clarify that Rodolfo Delgado first took the bench in 2001.